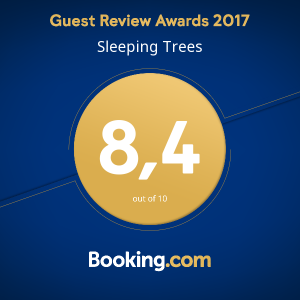 Sleeping Trees is located on Koh Rong Sanloem’s sunset beach. 25km off the coast of Sihanoukville, Cambodia. The trek across the jungle takes around 40 min, doable with flip flops for the adventurous. It is 10 minutes flat, 15 mins going uphill, 15 minutes going downhill : It is challenging and is not doable with a wheeled luggage ! The jungle trek begins at the back of the Diveshop on Saracen Bay which is where most boat services arrive and depart to and from Sihanoukville. Saracen Bay is located on the opposite side of the island to Sunset beach. There are various boat services to Koh Rong Sanloem. Speed ferry services come to the island in 40 minutes! They stop in Saracen Bay, which is on the other side of the island. Make sure your boat stops at “orchid resort” pier to avoid a long walk on saracen bay. Along the beach you will find a signpost which will direct you to the jungle path across the island to Sunset Beach. Ask for directions at any of the resorts on Saracen Bay. For more information on ferry services to Saracen Bay, Koh Rong Sanloem, ask at any of the information centers in Sihanoukville, or local travel agents. Schedule and prices change often.